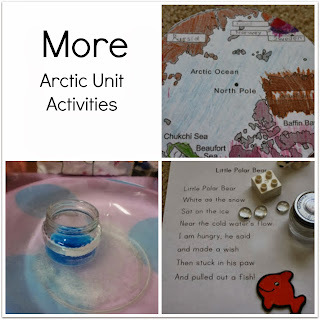 Over the weekend I found a great Arctic unit put out by SeaWorld and also got a few more ideas of my own. We made Polar Caps. The Arctic Circle was glued onto a plate and made into a cap by attaching ribbon to tie her Polar Cap to her head. We observed and compared the relative densities of fresh water and salt water. I did this completely wrong,. Fill the baby food jar with blue water, cover with plastic wrap, put in big bowl of salty water, remove plastic wrap and see blue fresh water rise out of jar. I, for some reason, thought the whole jar should float (which it did once I removed half the water!) We still have to do this again the correct way. We observed how water expands as it freezes. We filled a bottle of water and I asked Bear what she thought would happen if we froze the water. Would the water get bigger or shrink. She said it would shrink and saw that her hypothesis was incorrect. Made a paper mache igloo after being inspired by this Totally Tots post. Used packing peanuts to try and build igloos. Hypothesizing how much water is needed to make good diaper snow. Our polar bear poetry basket (idea for poetry baskets comes from My Montessori Journey). 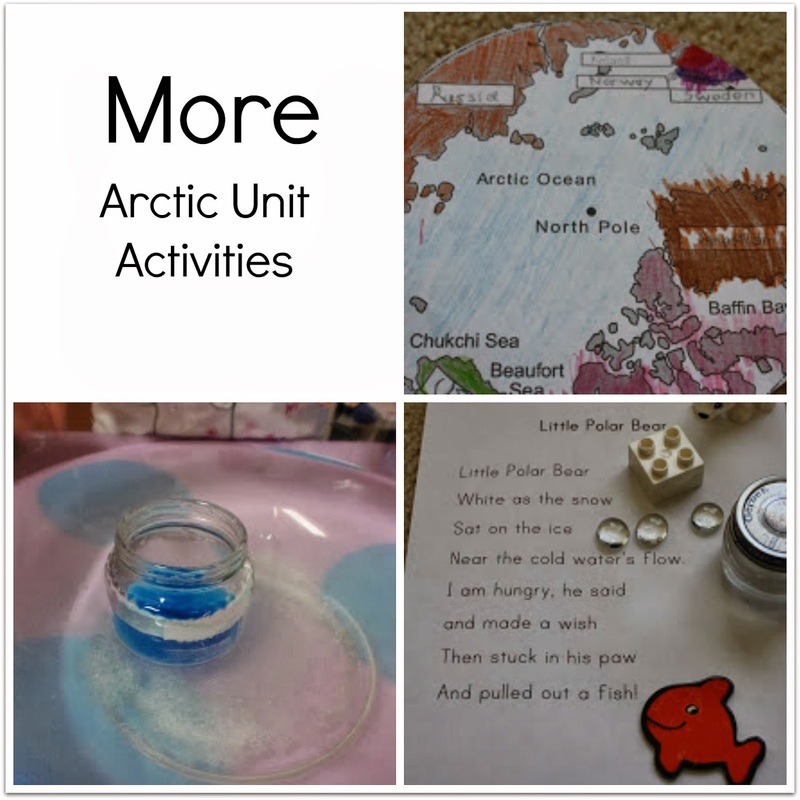 Arctic pretend play, building igloos, creating dogsleds with all the child sized chairs in the house, and cooking seal meat in melted snow. So many fun activities!The diaper snow was on ABC&123- perhaps that's where you saw it? Thanks, Kara! That's exactly where I saw it and I knew it was from Ticia and when I couldn't find it on her blog, I got very confused! lol. Actually I did it on my blog over a year ago, and then did a second post last week, so that's probably why you were confused.I love that last picture. Is that a glow worm? I came across all of Sea World's resources last year when I was planning a trip for the end of the year, the trip didn't work out though…but I still love the site. I wanted to get the Artic Circle map. Where did you find it? or post it a link? I just edited the link (Arctic unit) above the photo of the map. The map is near the end of the pdf.